File photo Air Force Marathon registration has opened. Registration prices from Jan. 4 through Feb. 17 will be $80 for the marathon, $70 for the half marathon, $35 for the 10K, $25 for the 5K, $135 for the challenge series and $12 for the 1K kids race. Prices will increase after Feb. 17. WRIGHT-PATTERSON AIR FORCE BASE — Registration for the 23rd Annual Air Force Marathon has officially opened. Runners can register at www.usafmarathon.com by clicking the registration tab. After a successful first year, the Fly – Fight – Win Challenge Series will be returning and adding an additional option. Runners can register for either the 5K, 10K and half-marathon races just like last year or the 5K, 10K and full-marathon races as one event. In completing either challenge, runners will receive an additional, premium medal. Registrants for the challenge must still be able to complete the 10K race in one hour or less (9:41 pace) to be able to make it to the half or full marathon start time. Organizers are also adding a 1K kid’s race, The Tailwind Trot, for children 4-12 and their parents scheduled for 6 p.m. Friday, Sept. 20, just before the 5K event. Registration prices from Jan. 4 through Feb. 17 will be $80 for the marathon, $70 for the half marathon, $35 for the 10K, $25 for the 5K, $135 for the challenge series and $12 for the 1K kids race. 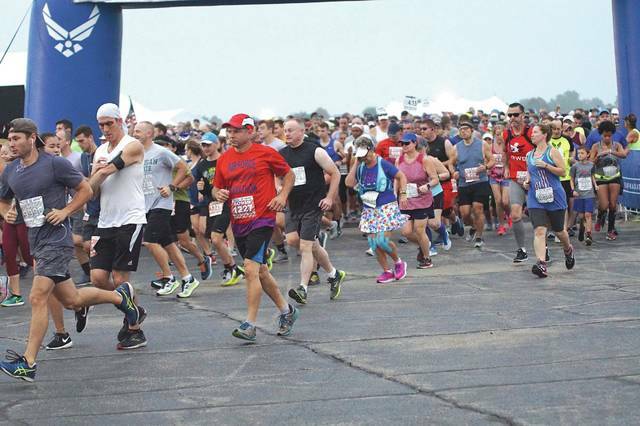 Prices will increase after Feb. 17.
https://www.fairborndailyherald.com/wp-content/uploads/sites/50/2019/02/web1_afmara20185.jpgFile photo Air Force Marathon registration has opened. Registration prices from Jan. 4 through Feb. 17 will be $80 for the marathon, $70 for the half marathon, $35 for the 10K, $25 for the 5K, $135 for the challenge series and $12 for the 1K kids race. Prices will increase after Feb. 17.